I am having too much fun making PJs for L. Here's another set of the Stitch Magazine Comfy Sleep Set PJs that I first showed you in my previous post . The dark pink fabric is from an old t-shirt I was about to donate and the other fabrics and ribbing are from the stash. L is just starting to stand on her own and walk, so here she is showing off her new skill. 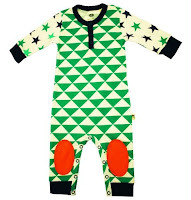 I was inspired by these pajamas that I found on www.green-cotton.dk (the direct link to this product no longer exists). I like the mix of fabrics and the knee patches. Miss Sarah asked if I hemmed the two front bodice pieces together or separately - I hemmed the them together as one. Now that the evenings are getting warmer, I may adapt the pattern to make short sleeves instead of long and shorts instead of pants. Your child is so sweet to be almost edible! 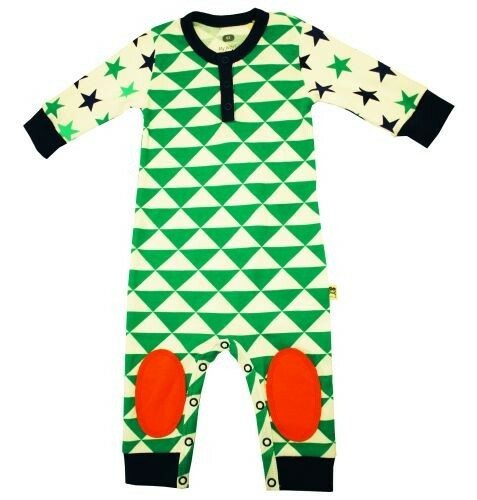 Love the combination of fabrics in the jumpsuit. Oh my! What a cute little munchkin! Those PJs look adorable. It must be so gratifying to sew something so tiny and quick. i love colourful pyjamas - she is adorable!